Super Heavy Duty Base - the most solid cast iron base of our professional forms ensures the very ultimate stability for your form. The height of the form can be adjusted through the base pedal. Which are the most important measurements? The most important measurements for your dress form would be the three basic ones - bust, waist and hips. Generally speaking, the other measurements should be easy to compensate for. I am falling in between several or your sizes. Which one should I get? Falling in between sizes is actually very common - most people do not match up exactly with one of our sizes. 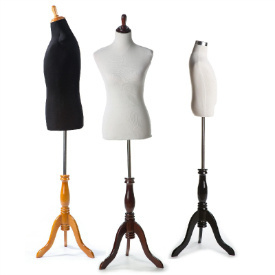 To get an exact match, we usually advise on choosing the smaller of the sizes and padding up where necessary. The reason for this is that you can always pad a smaller form up in size (in those areas where your numbers are higher) but you can never pad a larger form down in size (in those areas where your numbers are lower). For example, if your measurements happen to be bust: 34", waist: 31" and hips: 39", we would advise on getting the size 4 (bust 33.5", waist 25" and hips 35") and simply use some padding to bump up the waist and hips measurements to be an exact match. The size 6 would usually also work in this case (because the bust variation of 0.5" is very small). You can use any type of padding to adjust the measurements, but using the Fabulous Fit Padding System will make the adjusting very easy. Please also feel free to email us with any questions you may have. How important is it to find an exact match? This will really depend on your requirements. We have found that for basic fitting, small differences in sizing are usually very easy to compensate for. These small variations will often not even be noticeable because it is small when factored around the entire circumference of the form. If you are using the Fabulous Fit Padding System you should be able to get the form to be an exact match. The padding kits come with a stretch cover which fits over the pads to cover them up (and also holds the pads in place). The form will look solid and complete afterwards. What about petite (short) or tall people? Most of the measurements on our chart are "horizontal measurements" (such as the bust, waist and hips). It is also important to factor in the "vertical measurements" as well - meaning the vertical space in between these measurements. The important vertical measurements to check out would be the front length (neck base to waist) or the back length (neck base to waist). These specific measurements are a bit hard to take by yourself so if the numbers are off a bit it is usually not an issue. Our forms are designed for the so-called "average" height. For most people in this wider range, the forms work very well. However, those who are especially short or especially tall might find that, although their horizontal measurements do match up with those of a specific size on our chart, the vertical distance between those measurements (front or back length) are off. On an especially short person, their vertical measurements will be much smaller and on an especially tall person, their vertical measurements will be much larger. For such circumstances we advise on using the Fabulous Fit Padding System to correct this measurement. This is actually one of the primary uses of the padding kit. For an especially short individual, you would simply place the kit's hip pads (those specially contoured in a hip shape) on the form slightly higher that the form's actual hip area. This would then create a "new" higher hip area, which would thus shorten the vertical distance between these measurements. For an especially tall person, you would simply place these hip pads lower on the form than the form's actual hip area. This would then create a "new" lower hip area thus lengthing the form's vertical measurements. Do you manufacture custom forms? We only have our forms in the fixed sizes offered. Custom forms can cost many times more than one of our fixed size forms which can easily be adapted and made custom by using padding or the Fabulous Fit Padding System. Using padding, you will also be able to continuously adjust the form when necessary and you will not be stuck with one specific and expensive custom size. Let's face it, the human body changes measurements all the time. What are your most popular sizes? We are asked this question quite often. It is always best to know your potential audience and choose a size accordingly. We have brands who only order sizes 0 and 2, those who only get size 8s and even those who focus solely on sizes 18-24. In terms of popularity by order volume, we have found that the female sizes 4, 6 and 8 are the most popular (followed closely by 0, 2 and 10). In the male sizes, 36 and 38 are the most popular (please note that a male 36 has a 38" chest; a male 38 has a 40" chest). The child forms in the half body version would be 60 and 64. The child forms in the full body version would be 8 and 10 years. I am starting / already have a clothing brand with customers in all sizes. Do I need to get the forms in every single size? If you will be using the forms all at once or need to alternate quickly between the sizes, it would be best to have all the sizes at your disposal. Otherwise, you should be ok with some evenly spaced sizes (say a 0, 6, 10, 16 and 20 - for example) and just use the Fabulous Fit Padding System to cover the difference between the sizes. The padding kit can raise a form several sizes (and all the customizations in between). What is a "pre order"? Can I be added to a waiting list for a missing size? We try to keep all of our sizes in all of our models in stock. But it is difficult to do this all the time and we do occaisionally run out of stock on some sizes. If the size you want is out of stock, it might be helpful to check for the size in another model as the same size might still be available there. Pre Order: We intend on restocking any missing size. Sometimes, the restock has already been manufactured and is en route to our warehouse. For these sizes, we do allow pre-orders. Sizes which will very soon be in stock are listed in blue. Selecting one of these sizes will show the expected ship date (the date by which we will have received and can ship our new inventory) and it will change the "Add to Cart" button to "Pre Order". Preorders are paid for at the time of the order and are shipped when they arrive. There is currently no way to 'reserve' a pre order size without being charged. Out of Stock: These are sizes which we will be restocking only that they are not on our next shipment. These sizes are marked in red and cannot be preordered. However, selecting the size will cause a sign up form to appear. You can register with this form to receive a notification when the size you want will be made available for preorder. We do not ship directly outside of continental United States, however, we have partnered with a prominent freight forwarder who can arrange for international shipping. The details of this program can be found here. We do have many international customers using this program. Please let us know if you have any questions about international shipping. Do you accept purchase orders for large orders? We do accept valid purchase orders from schools and larger brands. Please contact us beforehand should you require a quote or any other information. Purchase orders can be sent to us at sales@theshopcompany.com. 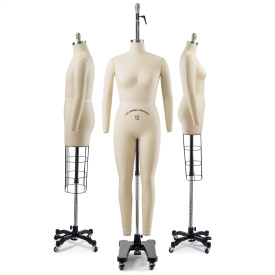 Professional - our top of the line professional full body child form built for tailors and seamstresses for child's sized clothing. 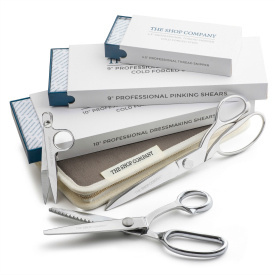 Quality Canvas - not purely for aesthetics, the high quality canvas material can withstand the brutal pinning that tailors and seamstresses like to subject these forms to. Adjustable - the height of the torso can be adjusted by raising or lowering the pole by use of the t-screw on the side of the pole. Sizes - we currently sell 5 sizes for the male full body professional form (we hope to add on some more sizes in the future). Please check the 'size' dropdown for the sizes that we have in stock at the moment. Full Body - create or show child sized form fitting pants with the padded legs on this top of the line dress form. Please note: unlike the our other full body dress form models (the male and female), this child form does not have collapsible shoulders.